The ‘Blue Moon’ also known as the Wild Sweet William is a fragrant ground-cover Phlox. It was introduced by the New England Wildflower Society. It’s ideal growing place is in the Northeast, Midwest and Southeast. It features regal lilac-blue flowers that sit atop green foliage. It is perfect for a rocky, woodland garden. You can plant it alongside Ferns and Hellebores. As it grows it forms a creeping carpet with entwined hairy stems that are not tightly knit. Its oblong leaves are evergreen under the right conditions. Plant it in a shady spot for it to naturalize. Being a native plant, it is deer resistant and attracts butterflies and hummingbirds. A great native groundcover. 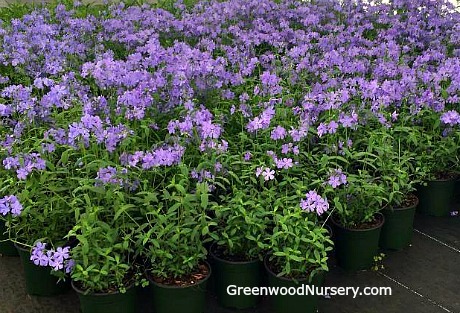 This woodland phlox bloom time is between early to late spring with a very fast growth rate. The best planting time would be between Spring and Summer. When planting the crown of the plant should sit above the soil surface when watered in, with 16” space between individual plants. It is sensitive to light and should be grown under the shade with minimal exposure to the sun. It is tolerant to wetness so optimum soil conditions are moist, rich, well-drained normal or clay soils. It is a rapid spreader so you should trim it by cutting back the flowers while they are fading. You can use it’s nodes to plant new blooms. Phlox divaricata 'Blue Moon'. It is great to plant next to alternating season blooms, it’s thick foliage will cover the wilted neighboring plants. Its creeping nature makes it perfect for covering hard to care for areas such as in between trees or steep rocky slopes. It provides early season nectar for Swallowtail butterflies and other pollinators. In winter it’s foliage turns burgundy providing a variety of color for your garden.